Ice Out on Lake Winnipesaukee! This should be the week! Temperature gauges are indicating that the water temperature in Lake Winnepesaukee, New Hampshire’s largest lake, is at 41 degrees F. This is typically the temperature at which the big lake is finally freed from its ice-bound prison. Steve and Carol, like other Lakes Region residents, eagerly await “Ice-Out” as it signals the end of winter and the start of spring. It is also the unofficial start of boating season, and how everyone longs to be back on the water! "Ice-Out" is official when the ice that has covered the lake since late December has melted enough so that the lake’s signature cruise ship, the M/S Mount Washington, can navigate between Alton Bay, Center Harbor, Weirs Beach, Meredith and Wolfeboro. It does not mean that the ship will get underway, just that it could if it wanted to. Ice-out means islanders can return to their cottages, and soon the summer people will head back to check on their camps. The date for ice-out has been observed and recorded for more than 130 years. The earliest date for ice-out was March 23, 2012, and the latest was May 12, 1888. Initially, the ice-out date was noted by those on land, but in the 1980s it started being recorded by plane as local pilot Alan Emerson of Emerson Aviation did a fly-over. Since 2002 his son, Dave, has taken over the task. As signs of spring appear, Dave flies over the lake several times a day, checking the breakup of the ice at each of the lake’s main ports. When he makes the ice-out call, that means it is official! There are several contests people can enter to see who guesses the ice-out date correctly. One is run by PSNH (now Eversource) and the other is posted at www.winnepesaukee.com, where you can also see daily photos of the ice. Rumors are flying that this could be the week, and Steve and Carol, along with other lake fans, are hoping it’s true. It’s been a long winter and everyone is ready for that season to fade away. With the lake back to clear, blue water, summer is just a warm day away! We hope to see you at the lake! While Steve and Carol Bush maintain a strong virtual real estate presence for clients, they also target customers through proven marketing vehicles such as direct mail, print advertising, brochures, flyers, signage, and networking. This comprehensive approach maximizes visibility for the client and ensures that information about marketed properties reaches the broadest possible audience. The power of a well-done print piece is not to be underestimated and Steve and Carol make sure that all of their brochures feature top of the line photography and design. A brochure is useful because it can be left with clients so they can refer to it again and again; its presence is also a reminder of the beautiful home that could be theirs. People may be surprised to know that direct mail still outperforms email blasts and is one of the most successful marketing tools available. A beautifully designed piece sent to a targeted list puts compelling and important information right in the hands of potential clients. People respond to a creative mailing and a hard copy item is more likely to be read and kept for further consideration. Electronic mailings, while useful, can be overlooked or even deleted, due to the overwhelming amount of email that most people receive today. Steve and Carol Bush also advertise key properties in select, quality magazines as well as real estate guides. These are the publications that dreams are made of, and the right ad can lead a customer to the home they have always wanted. The magazines and guides cover broad distribution areas and outlets so thousands of readers are reached with each ad. Flyers and mailings create more immediate awareness of properties for sale, directing both those searching, and “Sunday drivers” to homes on the market. Sometimes those who did not intend to be house hunting find themselves intrigued by the signage that Steve and Carol create. More than once that casual ride through the Lakes Region has led to queries about a home, and then a sale. Of course, nothing is more powerful then seeing a home firsthand, so Steve and Carol show perspective buyers to explore the home, experience its special features, examine the details, and picture the lifestyle that could be theirs. All of these elements go into the successful sale of a home and Steve and Carol have each one mastered. This is why they have achieved more than $35 million in real estate sales over the past five years. Every client receives a comprehensive, detailed sales effort, and when that is combined with Steve and Carol’s enthusiasm and expertise, success is guaranteed. When you're ready to sell or buy don't hesitate to contact Steve or Carol Bush as they are Experienced Realtors, helping buyers fulfill their dreams and sellers exceed their expectations. The snow may still lay deep here in the Lakes Region, but the maple sap is flowing, and the time for “sugaring off” has begun. For the next six weeks, the “sugar men” will work night and day to harvest “liquid gold” from the trees. To Steve and Carol, and all who live in northern New England, this is one of the true signs of spring. 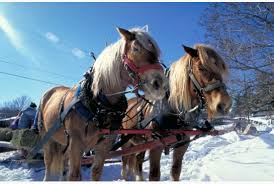 In the old days, maple sugar farmers headed to the woods with teams of horses, and the sap was collected in buckets. With thousands of trees being tapped, this was back-breaking work. Today, most large-scale sugar maple farms are networked into pipelines, with each tree’s taps connected into one overall system. Farmers then use a vacuum method to collect the sap. This process doesn’t pull the sap from the trees, but rather changes the pressure within the pipeline so that the sap flows more freely, even under colder conditions. From the pipelines, the sap goes through a reverse osmosis system, which streamlines the separation process. The reverse osmosis machine forces the sap, under pressure, through a series of membranes, which separate the water from the sugar--about 60 gallons of water are taken out at this time. From there, roughly eight gallons of sugar concentrate goes into the evaporator, where it is boiled down to make about one gallon of syrup. Every night during the season, sugar houses are in full swing, working against the clock to boil down as much sap as possible and make room for the next batch flowing in. Most houses boil for about four to five hours every night--and this is after the farmers have spent a full day in the field. 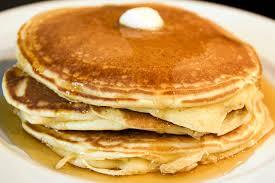 On average, it takes 40 gallons of sap for every gallon of syrup--a lot of labor for that one yield of sweetness. While many farms now use oil-fired evaporators, a wood-fired one is still the tradition, and still found at a number of New Hampshire farms. Using a wood-fired evaporator takes a lot of wood, but keeps another aspect of the state’s “sugar season” heritage alive. 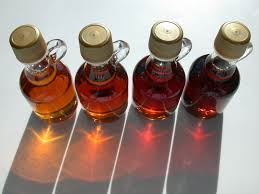 If you have not experienced it, Steve and Carol invite you to come to New Hampshire for Maple Sugar weekend, held this year on March 28th and 29th. During this weekend, sugar houses all over the state will be open. Visitors can see how the sugaring off is done, enjoy fresh maple syrup and other maple products (think cotton candy, soft serve and much more), savor farmer’s breakfasts, and at some farms, experience horse-drawn trips into the woods. The “sweet season” is just another reason why we love to call the Lakes Region home. Technology has changed everyone's lives in many ways, including how we do business. The real estate field is no exception. 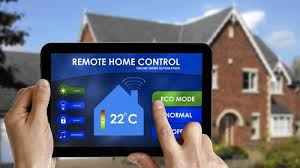 At Maxfield Real Estate, Steve and Carol Bush take advantage of all the technological tools at their disposal to make sure your property gets the attention it deserves. Did you know that nearly 90 percent of people looking to buy real estate search online for properties? Steve and Carol's comprehensive strategy lists properties on social media sites such as Twitter, Facebook, and You Tube; websites such as Google, Yahoo, and Bing; and industry sites such as LuxuryRealEstate.com, NHLiving.com, Realtor.com, Homes.com, and HomesandLand.com. By saturating these online locations, they automatically put your home in front of millions of people. A possible sale is just a click away! Steve and Carol also find the Internet is the perfect place to showcase your home visually, and in terms of the amount of information that can be presented. Their agency has two user-friendly websites, LakesRegionHomesInfo.com and NHLakesLuxuryHomes.com, and both are packed with details. These sites contain timely buyer information, all of their property listings, and offer advanced tools to aid in client searches. Steve and Carol also invite clients to use their interactive map to search by geographic area--they know the perfect home is waiting for you in the Lakes Region! Their dedicated mobile phone site allows you to view their mobile website from your iPhone, smart phone or tablet if you are on the road, or on the lake. Clients who are unable to visit the Lakes Region in person can still enjoy a complete showing of properties that interest them. Steve and Carol create a customized virtual tour for every listing. This tour is viewable on their website and their You Tube channel. Simply visit www.youtube.com or search LakesRegionHomesInfo.com on YouTube. Thanks to today's technology, buying--or selling--a home has never been easier! Yes, the calendar may say “March,” and spring is officially just a few weeks away, but here in the Lakes Region, with our abundant snow, winter is still here. This winter brought record snowfalls, and if you enjoy outdoor activities, there is no better place to enjoy them than here in Wolfeboro and Tuftonboro. Miles of cross-country ski trails take you through the woods and around the lakes and ponds. Snowshoers also find plenty of acreage to explore and both activities are a great way to get the family outdoors and exercising in the clean, fresh air. Wildlife is everywhere, and it is not unusual to see deer, snowshoe hares or even a fox. Look for tracks in the snow that reveal other woodland residents such as mice, squirrels and bobcats. Songbirds have not yet returned, but a flash of red or vivid blue means that cardinals and blue jays are about, as well as flocks of chickadees, sparrows, titmice and other birds. Wheeling about in the dazzling blue of a winter sky are hawks and even an eagle may be sighted. Cold temperatures have kept lakes and ponds safe for skating and ice fishing, and everyone is heading to local hills for old-fashioned sledding and tobogganing. It’s great to be a kid--or kid at heart--in winter! 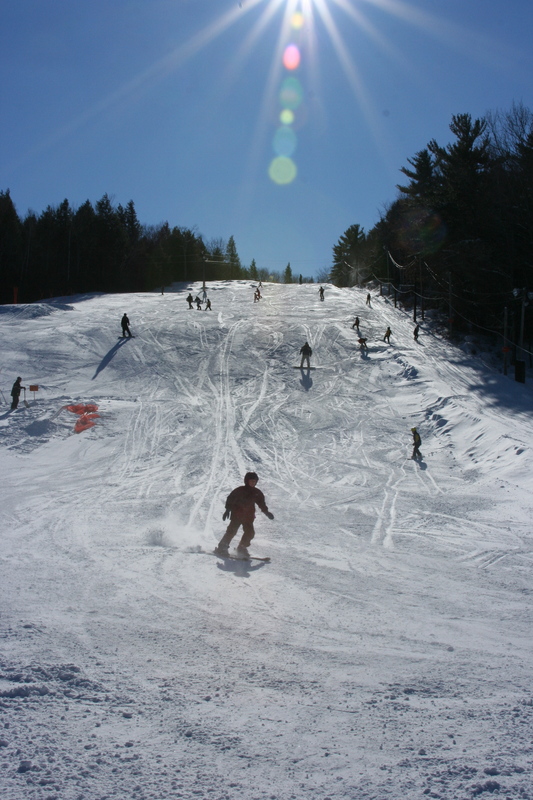 Downhill skiers enjoy Abenaki Ski Area, our own ski slope right in the heart of Wolfeboro (see February 26th blog), which draws families from far and near for both daytime and nighttime fun. Steve and Carol think March is the perfect month to enjoy our local “winter wonderland” as temperatures have started to moderate, with days more comfortable in the thirties and even forties (here and there). The sun is higher and days are longer, so it is even possible to ski in just a heavy wool sweater or fleece, thereby enjoying the best of snow and sun at the same time! We will be among the first to welcome spring, but until then, we are happy to enjoy our Winter Wonderland here in the Lakes Region. If there is one place that sums up the unique community spirit of Wolfeboro, it is Abenaki Ski Area. Generations of children have learned to ski at this small, family-oriented ski slope, which first opened in 1936. In fact, Powder magazine, a leading magazine of the skiing world, sees Abenaki as “The Most Important Ski Area in America.” According to Powder, small, town-owned ski areas such as Mt. Abenaki play a vital role as they not only attract people to skiing they help sustain their love of the sport. Affordable and local, small-town slopes such as Abenaki provide that special fun and nurturing environment that forges memories and encourages long-term relationships with the ski area and skiing. On any given weekend, it’s easy to see memories are being made. Children barely knee-high grab onto the rope tow; teenagers zip off the jumps, while parents glide gracefully down the trails. Hot chocolate and cheeseburgers are being wolfed down and it seems like everyone is smiling. Just looking at the scene makes you happy. In the beginning,Abenaki was owned by the Hershey family who generously allowed trails to be cut, a lodge to be built and a rope tow to be installed. The Abenaki Outing Club added lights and soon people were flocking to winter carnivals and night skiing at the mountain. As time passed, the ski area continued to grow, adding trails and ski jumps. Local high school ski teams started training here; kids eagerly headed to Abenaki to ski after school, and families poured onto the slopes every weekend. The Hershey family sold Mt. Abenaki to the town in the late 1960s and for the next decade or so the happy times continued. However, by 2000, Abenaki was in trouble. Lean snow years had taken a toll on usage and revenue; ski equipment was aging and falling into disrepair. Some town officials wondered if the area was still viable. Fortunately, when word of Mt. Abenaki’s situation got out, the townsfolk rallied--in a big way! 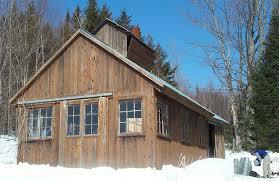 The Friends of Abenaki formed and money was raised to restore the ski area to its former glory. A new rope tow was added, snow grooming equipment purchased, and most exciting, portable snow-making equipment was bought in 2006. Today, more skiers than ever ride the slopes of Abenak. The ski area entered its 79th season in December of 2014, making it currently the oldest small ski area in the United States! I am thrilled to report that the last 10 seasons have seen incredible growth, and in fact, Abenaki has seen a record INCREASE in skier visits--one of the few ski areas in New Hampshire to do so. The Friends of Abenaki are now raising funds for a new ski lodge and hope to see that completed this year.At this year's town meeting the voters of Wolfeboro are being asked to approve Article 8 to help replace the 75 year old lodge at the ski area. Private donations will be $350,000 with the town being asked for $250,000. Steve and Carol are proud to have supported Mt. Abenaki through Maxfield Real Estate’s “We Care Program” and look forward to seeing many more children and families heading to the slopes for years to come. We believe it is important to play an active role in helping the people and organizations in the region we call "home." This is why we are actively involved in Maxfield Real Estate's "We Care Program." Established in 1999, the We Care Program was meant to be a one-year charitable program in honor of Maxfield Real Estate's 45th year in business. The program was created as a way of giving back to the local community. A percentage of each commission dollar would be donated to non-profit organizations located within the company's service area. However, the funds raised by that one-year effort became such a significant force for good that the We Care Program has remained a vital part of the company. We have personally seen how these contributions have enriched and improved the quality of life for area residents. Maxfield Real Estate has three offices, in Alton, Center Harbor and Wolfeboro, and we have found it very rewarding to see how these donations have made a difference in each town. The We Care Program is a way for Maxfield Real Estate to express gratitude to the people who use our real estate company. By aiding local nonprofits, we have helped a diverse and vital group of organizations, including the Appalachian Mountain Teen Project, the Central New Hampshire VNA Hospice, the Friends of Abenaki Ski Area, the Great Waters Music Festival, the Lakes Region Conservation Trust, the Lake Wentworth Foundation, the Lakes Region Humane Society, Life Ministries Food Pantry, the New Hampshire Preservation Alliance and many others. Upon closing the purchase or sale of your home, we will happily donate to the local charity of your choosing. To date, the We Care Program has raised over $718,000 for more than 275 local charities. In the last three years, we are pleased to announce that Steve and Carol have donated more than $14,000 on behalf of our clients. Youve been seriously thinking about selling your property and are now ready to list it on the open market. One of the most important decisions for any seller is to decide which company and which Realtors will provide the most aggressive marketing plan and which have a proven record. Ninety to ninety-five percent of buyers search for real estate online. A major online presence for your property is critical to getting the message out to buyers so they find your property and then request a showing of your property. Having an aggressive marketing campaign executed on the internet and in print by your Realtor is step one. Not all websites and real estate companies are equal. After exploring the website of a real estate company check out the individual website(s) of the Realtors you are considering. It doesnt take long to realize that a well built and maintained real estate website is current, complete and easy to use. At Maxfield Real Estate we are very proud of our website www.MaxfieldRealEstate.com and Realtors Steve and Carol Bush take special pride in their personal real estate websites www.LakesRegionHomesInfo.com and www.NHLakesLuxuryHomes.com. Check any of these sites - were confident that youll find them to be, if not the best, some of the best. We seasonally purchase pages in Homes and Land magazine and we will advertise your property in this magazine particularly during the summer months. This magazine reaches upwards of 20,000 people interested in real estate in the Lakes Region of New Hampshire. Outside of the extensive Maxfield advertising we personally will advertise your property seasonally in newspapers around the Lakes Region as well as in The Laker and Homes & Land Magazine. We are two of the very few Realtors listed as Elite Agents for Luxury Real Estate in New Hampshire and your property would be on LuxuryRealEstate.com. Please check us out on this website! 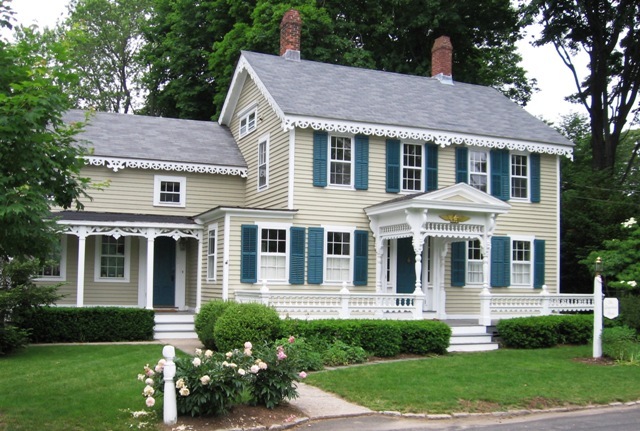 All real estate websites including NHLuxuryHomes.com, Realtor.com, Northern New England Real Estate Network (Multiple Listing Services), LuxuryRealEstate.com, Homes.com, Trulia, Zillow, MaxfieldRealEstate.com, NHLakesLuxuryHomes.com, etc.